The Mekong River is one of the truly grand natural features of southeast Asia, a waterway that connects cities, countries, and cultures, and thousands of years ago made civilization possible along its banks. The River starts in Tibet, runs through China, then functions as the Laos-Thailand border, before passing through Cambodia, then Vietnam, before finally emptying into the sea. 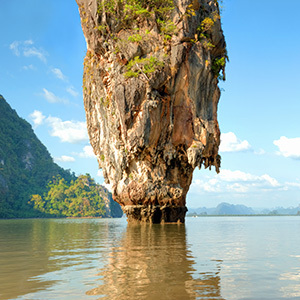 A tour along the Mekong is a great way to see many vibrant cultures, which have existed for thousands of years, as well as a wide variety of nature scenes – for the Mekong is one of the most biodiverse areas of the entire world. Avalon Waterways offers cruises along the Mekong, learn more about these cruises and what you can expect to see. Your itinerary will start in Ho Chi Minh City, as before you get on the river itself you can take a tour of the city. Included in the city tour, among major landmarks and other hotspots, are a hands-on Vietnamese cooking class and a tour of the tunnels used by the Viet Cong. From there, you’ll board your ship and proceed north along the Mekong River. 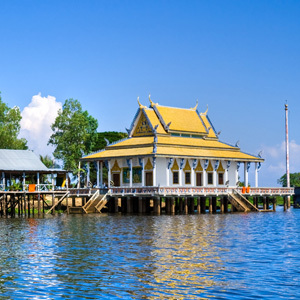 You’ll spend some time in Cai Be, visit its floating market, and see a French cathedral, among other things. Following that, your cruise ship will head across the Cambodian border, eventually settling into Phnom Penh for another overnight excursion. The capital and largest city of Cambodia, Phnom Penh is a metropolis rich in history and culture, which traces its founding back to the 14th century. While you’re there, you’ll get to visit a wide range of landmarks and places of historical interest. You’ll get to see some of the French colonial influence on Cambodia’s architecture. You’ll be able to visit the Royal Palace, the royal home of the king of Cambodia since the 19th century, and the adjacent Silver Pagoda, which is the official temple of the king of Cambodia and also contains a number of valuable religious artifacts and other national treasures. Not all history is to be celebrated, but “Those who cannot remember the past are condemned to repeat it.” You will also see the evidence of a recent dark period in Cambodia’s history, the reign of the Khmer Rouge, including one of the “Killing Fields” in Phnom Penh. After leaving Phnom Penh, you’ll get to visit a number of other Cambodian villages and temples over the next several days, until your cruise arrives in Siem Reap for disembarkation. You’ll get to see many cultural sights there, but the most famous of all is Angkor Wat, the ancient complex of temples once built in the 12th century and now, thanks to conservation efforts, remains the largest religious monument in the world. It’s unmissable. Avalon Waterways offers a variety of river cruise tour packages that include this river cruise along with other destinations. (They also offer it in reverse order, southbound, if you’d prefer that.) If you’d like to book this tour of the Mekong River, visit AffordableTours.com to get the best price. Save Up To 40% On Mekong River Cruises! Did you find this article helpful? Comment below and tell us!